SHALDON, THE CLIFFORD, 34 Fore Street, TQ14 0DE. JAZZ CAFE. Sunday lunch reservations: 01626 872311. Amazing Sunday lunch menu and happy, swinging music. SHALDON. St PETER’S CHURCH TQ14 0DB. ANNUAL MARDI GRAS NIGHT!!! Bring your own picnic, drinks and, especially your brolly! Proceeds for Shaldon Schools Outreach Project. Tickets £5 from 01626 873492. STOKE CLIMSLAND, nr CALLINGTON, CORNWALL. THE OLD SCHOOL HOUSE, PL17 8NY. John Shillito, John Wurr, Bobby Fox, Pete Furnish, Richie Bryant, Simon Banks, John Whitlock - blowing up a storm! Info and tickets from Brian Champness: Mobile: 07887887298, Home: 01579 370589. TORQUAY, St MARYCHURCH, TQ1 4QA. CROWN & SCEPTRE. 01803 328290. Hot Club of Torbay! The best jazz and the best beer in the Bay. PLEASE NOTE EARLIER START TIME. BLACKAWTON, nr DARTMOUTH TQ9 7DE SPORTSMAN'S ARMS, Hemborough Post, TQ9 7DE. Great music! Great food! Info: 01803 712231. Friendly pub! Great platefuls, fine ales and superb jazz. ST ERTH PRAZE, SMUGGLERS INN, 51 CLUB. The Ramblers are back with their warm, friendly, melodic jazz. Timeless tunes and irresistible rhythms. HONITON, HEATHFIELD INN, Walnut Road, Honiton, Devon, EX14 2 UG. Good food; phone for reservations 01404 45321. The monthly "make Honiton happy" get together. MARLDON, TORBAY, Vicarage Road DEVON, TQ3 1NN. YE OLDE SMOKEY HOUSE. Table Reservations: 01803 557630. Music, mellow and magic. 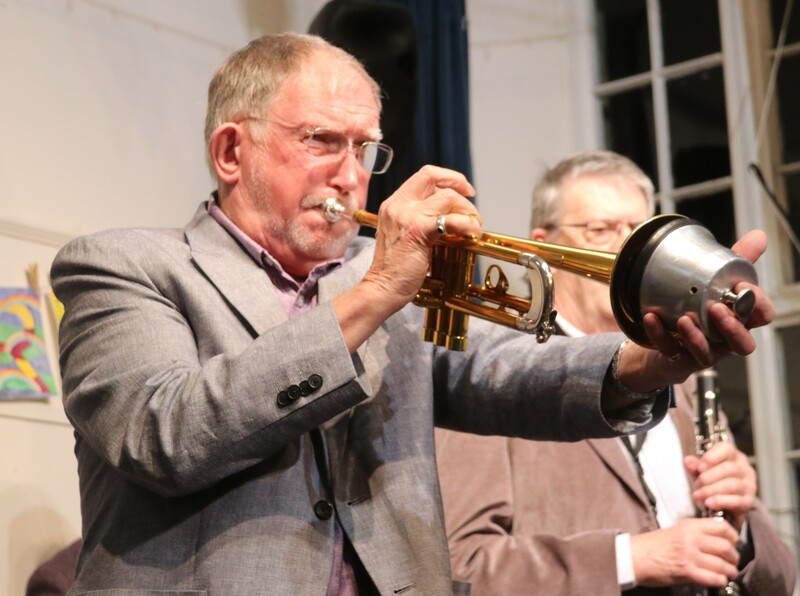 Fri 5th 8.30 pm RIVIERA RAMBLERS TIVERTON, FIRST FRIDAY JAZZ CLUB at THE OAK ROOM ARTS CENTRE, 2c St Peter Street, Tiverton, Devon, EX16 6NU. Phone (Wed - Sat, 9.00 am - 6.00 pm) 01884 257 136 or 07818 257 136. Email: oakroomtiverton@gmail.com Looking forwards to our Tiverton First Friday debut! TORQUAY, St MARYCHURCH, TQ1 4QA. CROWN & SCEPTRE. 01803 328290. John Shillito, Simon Banks and their guests welcome you to the Hot Club of Torbay! The best jazz and the best beer in the Bay. PLEASE NOTE EARLIER START TIME. BLACKAWTON, nr DARTMOUTH TQ9 7DE SPORTSMAN'S ARMS, Hemborough Post, TQ9 7DE. Info: 01803 712231. Friendly pub! Great platefuls, fine ales and superb jazz. Fri 12th Evening RIVIERA RAMBLERS BRIXHAM. THE BIRDCAGE, New Road, Brixham, TQ5 8LT. Swing music for the VIP opening of this newly refurbished Punch Taverns pub. Sat 13th 1.30 pm RIVIERA RAMBLERS BUCKFASTLEIGH STATION TQ11 0DZ. South Devon Railway Trust. Playing for the 50th anniversary celebration of this fine preserved steam railway. DARTINGTON "SHOPS AT DARTINGTON" (THE CIDER PRESS CENTRE). Crafts, food shops, etc. Shinners Bridge, nr TOTNES, TQ9 6TQ. 01803 847500. Great shopping, things to taste, and tasty, fun music. HONITON, HEATHFIELD INN, Walnut Road, Honiton, Devon, EX14 2 UG. Good food; phone for reservations 01404 45321. John joins Roger again for the monthly "make Honiton happy" get together. RIVIERA RAMBLERS DARTINGTON "SHOPS AT DARTINGTON" (THE CIDER PRESS CENTRE). Crafts, food shops, etc. Shinners Bridge, nr TOTNES, TQ9 6TQ. 01803 847500. Great shopping, things to taste, and tasty, fun music. TORQUAY, St MARYCHURCH, TQ1 4QA. CROWN & SCEPTRE. 01803 328290. Hot Club of Torbay! The best jazz and the best beer in the Bay. Wed 8th 8.00 pm RIVIERA RAMBLERS + MANY GUEST MUSICIANS SHALDON, THE CLIFFORD, 34 Fore Street, TQ14 0DE. JAZZ CAFE. A very special jazz evening. SPECIAL CELEBRATION AND BENEFIT NIGHT FOR KEN RENNISON, our former saxophonist who has been forced to retire due to arthritis. Join the fun and support Ken. Free admission, donations box, raffle prizes and a great musical evening. Table reservations: 01626 872311. SAGA 7 DAY JAZZ HOLIDAY IN CROATIA at the superb METEOR HOTEL, MAKARSKA RIVIERA, DALMATIA, CROATIA. Spacious, comfortable hotel right next to the Adriatic Sea, with a backdrop of mountains. Great jazz, food, wines and accommodation with friendly, efficient, Croatian hospitality. SAGA HOLIDAY CODE AN 435. PHONE 0800 056 6078. DARTINGTON "SHOPS AT DARTINGTON" (THE CIDER PRESS CENTRE). Crafts, food shops, etc. Shinners Bridge, nr TOTNES, TQ9 6TQ. 01803 847500. ANNUAL FOOD FAIR. Yummy shopping, great things to taste, and tasty, fun music. SHALDON, THE CLIFFORD, 34 Fore Street, TQ14 0DE. JAZZ CAFE. Sunday lunch reservations: 01626872311. Amazing Sunday lunch menu and happy, swinging music. DUNSTER, near MINEHEAD, SOMERSET. YARN MARKET HOTEL. OUR ANNUAL SUMMER JAZZ HOUSE PARTY. Lots of fun, great food and music in a comfortable, friendly, family run hotel in a historic village on the edge of Exmoor. Yarn Market Hotel, 25 - 33 High Street, Dunster, TA24 6SF. Phone: 01643 821425. Email hotel@yarnmarkethotel.co.uk.